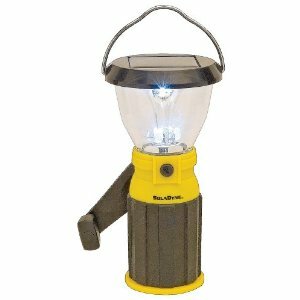 Mini Solar Lantern is a great personal sized solar/dynamo lantern that will hang inside a tent, on a string line or sit on the picnic table in the evening. No fuel or batteries are required. Powered by Solar Energy, Dynamo Hand Crank, 120V Wall charger or 12V Car Charger. Features high & Low light levels, cell phone charging, compact size and weight for easy storage and travel. Compact ambient lighting solution for camping, hunting, patio, home and emergency prepardness. Weights 10 ounces and stands 7 inches tall. Carabineer to hang in a tent or from a string. Compact ambient lighting solution fo camping, hunting, patio, home and emergency preparedness.